Sure, there are plenty of beautiful annuals, but perennials deliver the same beauty year after year. In this list of the best perennials we detail 20 different, but gorgeous perennials. With everything from ground cover to showy blossoms, the perennials on this list will provide you with years of satisfaction. 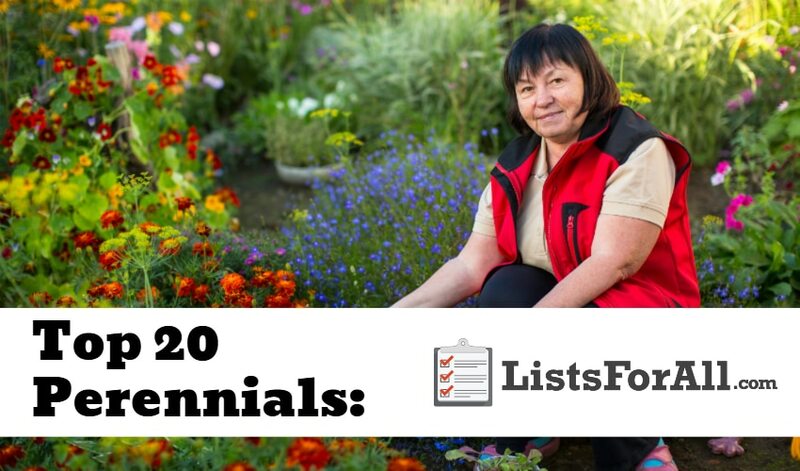 And thankfully, most of the perennials on this list are also low maintenance and easy to grow. This will ensure that even those with the blackest of thumbs can enjoy these beautiful plants year after year. Also, for beauty, both inside and out, check out our list of the best house plants. We detail some easy to grow house plants that will bring some life to your home. With just a few of the plants from these lists, you will be well on your way to creating an indoor and outdoor oasis! Also known as Veronica, Speedwell comes in several color varieties. This spiky plant grows in clusters and blooms from spring until fall. The height will vary anywhere from approximately 10 inches to over 3 feet tall. Also, several Speedwell varieties make an excellent ground cover, which will allow you to have a colorful, carpeted outdoor retreat. The peony perennial produces large, showy, and drop-dead gorgeous blooms. It is also able to grow in almost any climate and is virtually carefree, making it the perfect plant for those who don’t have a lot of time on their hands. Peonies can also easily live for decades. So make sure to leave some room around your peony so that you can enjoy its beauty and fragrance for years to come. Bugleweed comes in a variety of deep, rich colors and is a great groundcover evergreen perennial. Also, it can grow in almost any type of condition, including dry, shady conditions. This makes Bugleweed a good choice for areas where other plants may struggle to grow. A word of caution though. Bugleweed is such a good grower, that if not maintained, it will creep into other areas of your garden. The Daylily, or Hemerocallis, is a colorful and beautiful perennial. Most Daylilies bloom in both spring and fall. And, with no special maintenance required, you can enjoy blooms year after year without spending hours in care and maintenance. Many varieties of Daylilies also produce blooms of upwards of 800 flowers in a single summer. This is going to ensure that you get a big bang for your buck. The Yarrow flower, or Achillea millefolium, is an excellent ground cover flower. It is native to North America and is hardy and maintenance free. The Yarrow’s flowers may be yellow, red, pink or any number of shades in between. And, as a bonus, the flower also attracts butterflies and is an aromatic herb. Stonecrop is a type of succulent. It is a diverse group of flowers that includes tall flowers and mat-forming flowers. Depending on the variety Stonecrops, or Sedum, they can be sun loving or shade loving. They can also be drought tolerant or need watering regularly. So be sure to check the variety of Sedum that you are getting before planting. One of the more popular and well-known perennials. The Daffodil, or Narcissus, is a cheerful, flower that blooms in early spring in temperate climates. Often blooming in clusters, the Daffodil is usually seen in its signature yellow color. However, with more than 50 species and hybrids, the Daffodil can be seen showing off a host of other shades. Similar in appearance to a Daisy, Blanket Flowers, or Gaillardia x Grandiflora, have a long season of bloom (early summer to early fall). Blanket flowers feature stunning shades of orange, red, and yellow. Low-maintenance and hardy, the flowers also attract butterflies and have few insect or disease problems. With the look of a traditional daisy, the Shasta Daisy also offers evergreen foliage that can last year-round in many locations. The Shasta Daisy, or Leucanthemum x superbum, is great for filling in bare spots in a garden. It also comes in a variety of sizes (from just a few inches tall to over 3 feet). Making it a versatile flower that you can enjoy year after year. The Columbine or Aquilegia, is an elegant flower. It is a mountain flower that also blooms well in meadows and gardens. This perennial blooms from mid-spring through early summer and there are several varieties of the flower. Some of the varieties grow just a few inches tall and other growing up to 3 feet. All Columbines, however, have spurs that resemble eagle claws, hence its scientific name (Aquila is Latin for eagle). Part of the Lily family, Alstroemeria are often seen at the florist. With varieties that are also well-suited to home gardens, Alstroemerias are a great perennial option. Dwarf options of the Alstroemeria are also a great option for home gardens. They have vibrant blooms, and also work well in pots or mixed with other plants. Tall and regal, Phlox paniculata, or Garden Phlox or Summer Phlox, is a great perennial perfect for sunny borders. Clusters of pink, purple, or white flowers make for great cuttings, while the hardy plants make for easy care. The flowers do tend to develop mildew in hot and humid climates, however, so they are better suited to cooler climates. These perennials are beautiful in all seasons. Phlomis russeliana, or Jerusalem Sage (sometimes called Turkish Sage) is an aromatic plant with striking flowers. A quick grower, the flower grows tall (2-3 feet) and spreads wide, making it an ideal perennial for large spaces. While the flower is best in full sun, it can tolerate light shade, making it a great sunny border or wildflower plant. Sea Holly, or Eryngium, are similar to globe thistles but have a more distinctive look. The Sea Holly does well with salt spray (hence the name) and handles dry conditions well. This makes it a great perennial for areas where many other plants can’t survive. If you are looking for a distinct and hardy, blue and green plant, the Sea Holly is a great choice. The Forget-Me-Not flower, or Myosotis scorpioides, is a tall and colorful perennial. This pretty wildflower grows well in damp, shady areas. It is generally pink or blue, and spreads easily by self-seeding, making this a great ground cover perennial. A colorful and charming addition to any garden, the Forget-Me-Not is a perennial every gardener should utilize. With long arched stems full of delicate flowers, the Bleeding Heart perennial is a stunning plant. The Bleeding Heart grows well with ferns and other shade plants in moist soil. Depending on the variety, the plant can grow anywhere from 6 inches to 2 feet, making it a nice contrast to low-lying ground cover. Russian Sage is a member of the mint family. It is drought tolerant and produces beautiful purple-grey flowers. A hardy plant, the Russian Sage can grow up to 5 feet tall, and blooms from midsummer to fall. If you want a colorful plant that blends nicely with the rest of your garden, Russian Sage is a great choice. A colorful, daisy-like perennial, Asters provide a nice jolt of color to a garden. They do especially well in late summer when many flowers have stopped blooming. Asters also attract butterflies, so if you are planting a butterfly garden, Asters should be high on your list. This pretty ground-covering perennial boasts large leaves that grow through the seasons. In winter the leaves take on a deep reddish-purple color, providing a nice contrast to usually bleak surroundings. For an all-season ground cover, Winter Glow or Bergenia is tough to beat. Another daisy lookalike, the Coneflower is an easy to care for, drought tolerant perennial. Some varieties are also used in herbal remedies. Most grow around 2 feet tall, making them a good choice for a varied landscape. Sometimes gardens can be a lot of work, especially if you have to plant new flowers every year. That is why we decided to come up with a list of perennials that could highlight your garden from year to year without a ton of effort. The great thing about perennials is that they can also be used as the base for your garden. This will allow you to be able to also include some annual flowers each year as well to mix things up in your garden. We would love to have you leave feedback in the comments below, so please don’t hesitate to share!